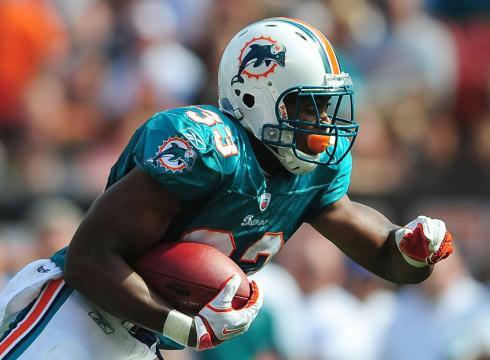 With Reggie Bush now in Detroit the Miami Dolphins will have fairly big shoes to fill at running back. In his two seasons as a Dolphin, Bush averaged better than 1,000 yards rushing per season and provided big play capability both on the ground and through the air. Tasked with the responsibility of replacing Bush will be second year back Lamar Miller and third year Daniel Thomas. While Bush averaged more than 1,000 yards per season with Miami, the Dolphins do not have a single player on the roster with 1,000 career rushing yards. Conventional wisdom seems to point to Miller being the starter. Even quarterback Ryan Tannehill has given Miller the endorsement, but should that be the case, Thomas will still take on a huge role for the Dolphins. The most experienced back on the team, Thomas has not lived up to the expectations set for him when the Dolphins took him in the second round of the 2011 NFL Draft out of Kansas State. Thomas has averaged just 3.5 yards per carry, but he carries a 230-pound frame and is more of a power runner than Miller. Thomas has also fought fumbling issues as he put the ball on the ground three times last season despite just 91 carries. Thomas however, is a better pass blocker than Miller and has an edge in experience. Thomas happens to also be Miami's leading returning touchdown scorer from a year ago as Bush and tight end Anthony Fasano each signed elsewhere during the offseason. Additionally, Thomas is the only player on the roster to have a 100-yard rushing game in his career. Thomas also finished with 15 receptions last season for better than 10 yards per grab despite being a bigger back. If nothing else, Thomas will be Miami's short-yardage back which is an important role and one of the roles that has suited Thomas best. All four of Thomas' touchdowns a year ago came on the ground and within three yards of the goal line. The Dolphins were in the middle of the pack in the NFL last season when it came to converting third downs. In a league where defensive interiors are bigger and stronger than ever before, games are often won and lost on third-and-short which makes Thomas' role all the more significant. While Lamar Miller is presumed to be the starting running back for the Dolphins in 2013, Daniel Thomas is Miami's leading returning rusher and touchdown scorer. Thomas will be an important piece for the Dolphins this upcoming season even if only as a short-yardage back. The most experienced back on the team, Thomas could be asked to provide some leadership for a corps of young rushers as well.